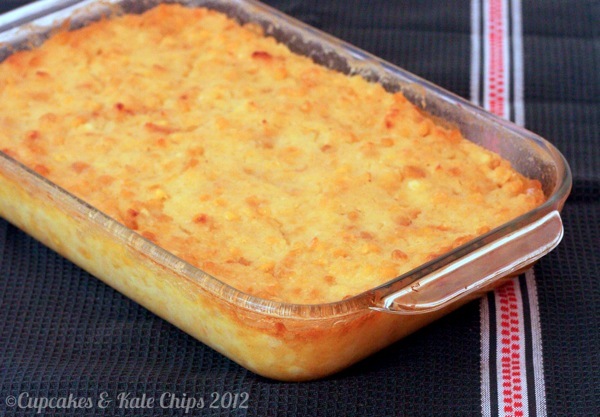 A creamy, sweet, savory, buttery, salty, eggy, corn casserole for an easy holiday side dish. 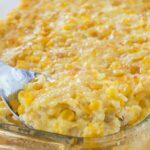 Corn Pudding is a favorite gluten free casserole recipe in my family for Thanksgiving and Christmas, and sometimes even Easter. 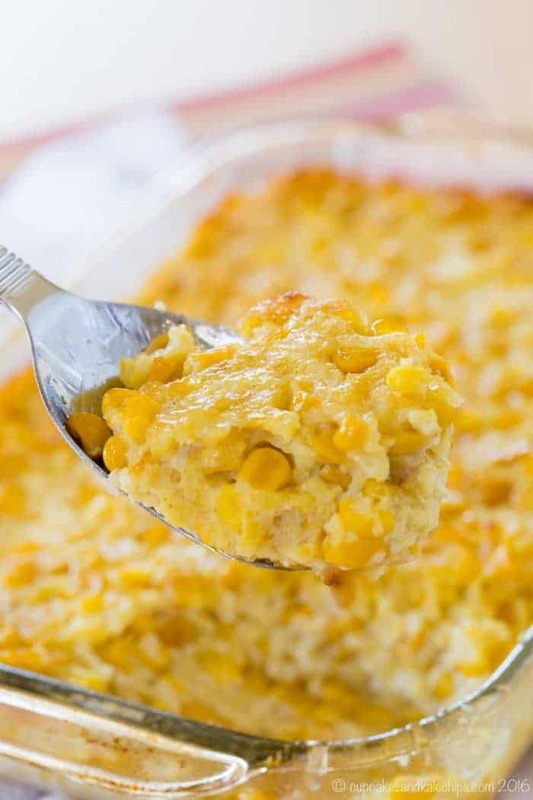 No holiday is complete without this easy corn casserole on our table. This post is not about pretty photos of a beautiful dish with bright pops of color, and contrasting textures, like this gorgeous Roasted Butternut Squash and Pomegranate and Goat Cheese Salad. Nor is it about fresh, local ingredients, clean eating, unprocessed foods, like these Balsamic Roasted Vegetables. It is about a corn casserole made with canned corn (yes, even the dreaded canned creamed corn) and white sugar and butter and seasoned salt (and sometimes even Egg Beaters, when I just want to quickly measure out the ten eggs needed for a double batch, versus cracking and beating them all). I’m sorry for this recipe. Actually, I am totally not, because THIS.IS.GOOO-OOOOD!!! And I eat it twice a year – Thanksgiving and Christmas Eve. So to be perfectly honest, I am not going to pay attention to people getting all up in arms on me about preservatives and GMOs and BPA, and the spoonful of Cool Whip I eat once a year with my Crustless Pumpkin Pies. I get all that. But, Corn Pudding, I can’t quit you. I know I told you about my issues with jarred gravy and green bean casserole made with canned green beans and cream of mushroom soup. And while I am a fan of dessert, when it comes to “real food”, well, I typically want REAL FOOD. But this creamy, sweet, savory, buttery, salty, eggy, corn casserole just draws me in. Oh goodness, I am going crazy thinking about it, because I don’t get it till next week!! 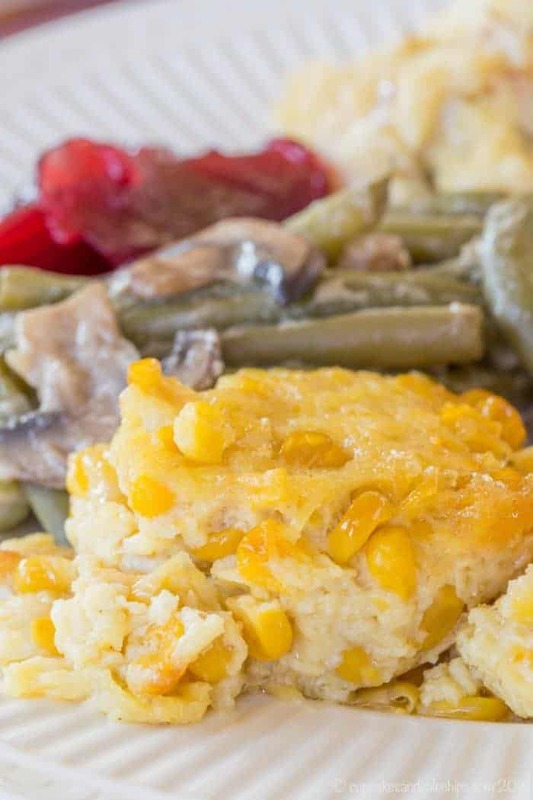 I will forego the mashed potatoes and turkey gravy and green bean casseroles on Thanksgiving, and the mashed potatoes and red gravy and fried shrimp on Christmas Eve just to make sure I get my fill of Corn Pudding before it disappears. And you know what, I’ll probably just make a double batch so that we have some extra at my uncle’s on Christmas Day. 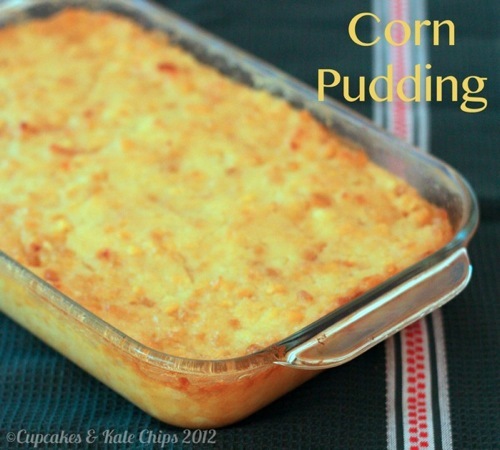 So this Corn Pudding recipe post is a little gift to my family. You see, we have been working off of this little scrap of paper my mom clipped out of a magazine years ago. 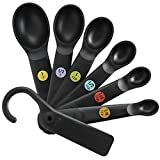 It was part of an ad for one of the ingredients, and I can’t even attribute it to the exact source, because there are several brand names listed in the recipe, and I have not ben able to find it online, despite exhaustive searches. Now we have it forever preserved electronically, and I can just print it out every time I misplace my one single photocopy. And to round out your Thanksgiving or Christmas menu, here are some recipes from my friends. This Healthy Sweet Potato Casserole from A Mind Full Mom is a great way to balance out the holiday indulgence. Add amazing flavor with Brown Butter Mashed Potatoes from The Food Charlatan. And the centerpiece of the meal is this Savory Herb Rub Roasted Turkey from The Little Kitchen. 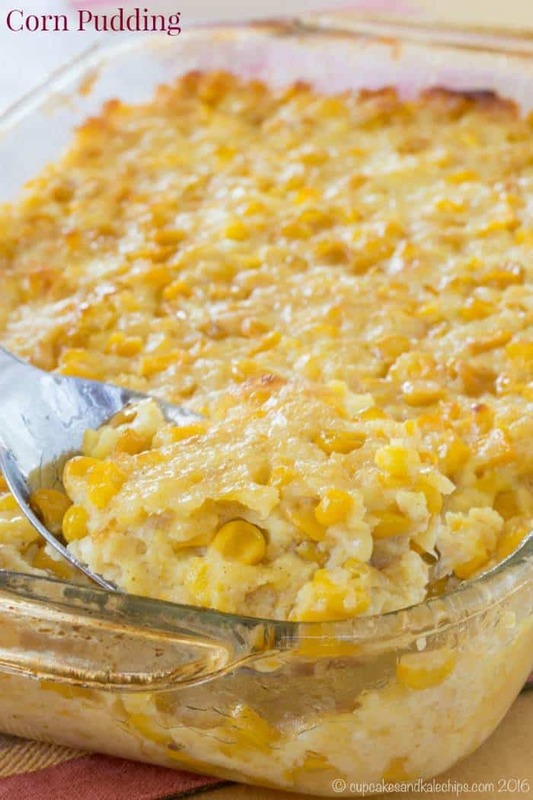 Enjoy this Corn Pudding Recipe! Spray a 3 qt. casserole dish or 9x13 in. 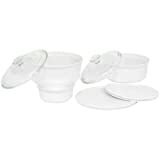 glass baking dish (or even disposable aluminum pan) with cooking spray or oil. In a large bowl, combine the corn and eggs. In a small bowl, combine the sugar, cornstarch, seasoned salt, dry mustard, and dried minced onion. Add this mixture to the corn mixture, and stir to combine. Stir in the milk and melted butter. Bake for 1 hour, stirring once, or until set and lightly browned, but still soft. 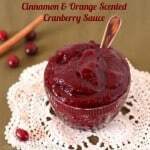 This recipe was originally posted on December 18, 2012. Photos were updated on November 8, 2016. Made this for Thanksgiving and my husband and I loved it. I wanted something that did not use a box of corn muffin mix as I didn’t want any cornbready texture. This came out so light and fluffy almost like a souffle. Will gladly make again and again, although I may try reducing the sugar a bit. I think it would also be great w green chiles and sharp cheese. Thanks for sharing! I’m so glad you enjoyed the corn pudding! I love the texture of it as well. Green chiles and cheese sound like delicious additions to the recipe, too! Can’t find 17 oz. cans of cream corn. Most cans of cream corn and corn are 14.34 ozs. 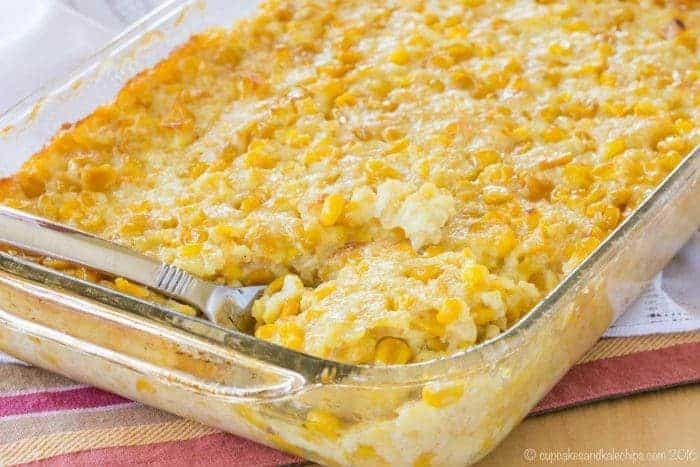 Can I use that size for this corn pudding recipe? You definitely can use a smaller size of creamed corn, Karen. I use two small 8oz sized cans. I hope you enjoyed the corn pudding and had a wonderful Thanksgiving, Glenda! I was going to ask a question, but then looked it up and found the answer for myself. I thought I’d pass along the knowledge…. I wondered if I could substitute potato starch for cornstarch. Evidently, potato starch doesn’t do well when cooked for a long period of time (as in this recipe). So… asked and answered – now I just need to make the dish!! I’m glad you found an answer, Sarah. I hope you enjoy the recipe! What is the best way to reheat this? 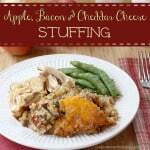 I want to make it for thanksgiving but will need to make ahead as the turkey will be in the oven. My suggestion is to cover the pan with aluminum foil and place it into the oven to reheat while your turkey is out resting. It should only take 20 minutes or so at 375. So excited to see that this is a GF version! Have always loved corn pudding but didn’t know how to convert. Was going to use a GF cornbread mix but I like the sound of the better and the fact is tried and true!! I hope you enjoy the recipe, Cathy! It’s now one of my favorite side dishes for the holidays. We loved this!! Truly loved it! I’m so happy to hear that you enjoyed the corn pudding, Kassia! I’m trying this recipe for Christmas. I’m so tired of green bean casserole. I’m hoping that this is what my southern grandmother used to make. She called it spoon bread. I’ll let you know. I hope you enjoy the recipe, Sheila. The consistency of this pudding is very much like spoon bread! This is my grandma’s recipe and I had NO IDEA it was gluten-free! Thanks for the “V-8” moment just when I needed one! I’m making this rignt now. I’m staring at the can of corn and all that liquid in it. You don’t mention draining the can of corn so I should just dump it all in? If anyone has the time to answer this that would be great. I’m so sorry that I didn’t get back to you sooner, Dianne. I hope that you drained the liquid from the corn and that the recipe turned out well for you. I’m sorry about my post. Your recipe does say to drain the corn–I read it several times and never saw it…my bad. I did drain the corn. The corn pudding was good but I had to cook it quite a bit longer to get any browning on the top. I’m so happy to hear that you like the recipe, Aniko! Have you tried cooking it in a crockpot instead? Thanks! I haven’t tried making this in a slow cooker, but if you do, I would suggest cooking it on low power so that it doesn’t become rubbery. I can’t give you any idea of cooking time, however. Also, keep in mind that the pudding won’t brown on the top if you make it in a slow cooker. I, too, have this original recipe cut out on glossy paper and carefully preserved as it’s been a MUST for every Thanksgiving since that McCormick’s ad came out. I was first introduced to this dish by a Southern friend who said it was traditional in South Carolina, and when I found this recipe, I was hooked. I moved recently and my recipes are still in storage, so I was SO happy to find this online. Many thanks for posting it. REALLY great dish! I love how the savoury ingredients add to the flavor as opposed to the usual sweet-only that corn pudding so often is (not that that’s a bad thing, hello!). This was a huge hit at an early Thanksgiving potluck last weekend, and I’ll be making it again for Thanksgiving Day with 24 friends, so will be making a triple batch (I’m smart enough to make enough so I can bring some home this time)! This recipe also makes it very easy to successfully add stuff like those bell peppers, scallions, or sweeter things like using canned condensed milk and/or sour cream, etc. But, as my mama always advised, and rightly so, make a recipe exactly as written first, THEN experiment! My mother can’t eat whole kernel corn very well. Do you think I could use 3 cans of cream style corn, and maybe adjust the amount of eggs and/or milk? Thanks! I haven’t tried it, but I’m inclined to think it would be very runny. I don’t think you’d need any extra milk, but I can’t say for sure. Something’s wrong. I’ve attempted to print this recipe 3 times. It prints on two pages, the first page is the ingredients and it is all messed up with symbols over the left side of the ingredients list. Could it be fixed –I’d love to have the recipe? I apologize for the inconvenience, Dianne. 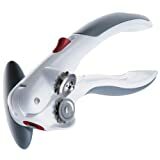 I’ve corrected the issue and you should be able to print the recipe without a problem now. Thank you so much! I’m looking forward to making this for T-day. I hope you enjoy the corn pudding as much as my family does, Dianne! Our family adds diced green peppers. At Christmas we add red and green peppers. Makes the dish more eye appealing and gives the dish more flavor. I love your addition of the peppers to the corn pudding, Ann. You are right… what a festive touch! Well, I want a big old scoop of this with some pie (with cool-whip of course!) and then round it out with my sweet potato casserole. The holidays are all about these comfort foods! I’m right there with you, Kristen! Can you freeze it after it’s made and heat it up at a later date ? Luise, I have not tried to freeze the corn pudding. I’d be inclined to think it won’t freeze well, but it can be mixed a day or two beforehand and either kept in the fridge before cooking, or bake it reheat when you’re ready to serve. It reheats nicely. In fact, I like reheating it in the oven to get the edges even more browned. I suggest reheating the corn pudding at 350 degrees F. Check it after 20 minutes and see if you think it needs additional time to heat all the way through. I hope you enjoy it! Video says hEat at 350, recipe says 400. Which one ? Oops, sorry! The recipe is correct – 400. How many servings will this recipe yield? Vanessa, of course, the size of an appetite may vary, but the corn pudding should easily serve 6 people, and up to 8 for smaller servings. Enjoy! That sounds absolutely delicious! I hope you enjoy the recipe with your alterations. Oh wow, my mom clipped it, but she clipped off so much we didn’t know the source. Thanks! Happy Thanksgiving!!! This was a home-run at our table today! Good thing I doubled the recipe: I brought home no leftovers!!! I have never cut it in half, so I’m not sure since it does call for 5 eggs. But you can definitely make it ahead. I’ve mixed it the night before and baked it the day I planned to serve it and baked in advance and reheated to serve. Both work fine. I want to make this ahead of time. I have a 2 hour drive. If I keep it in a cooler with ice packs on the drive, do you think it will be ok to pop in the oven and bake once I get to my destination? Lisa, I’m so sorry that I didn’t see your comment until now. 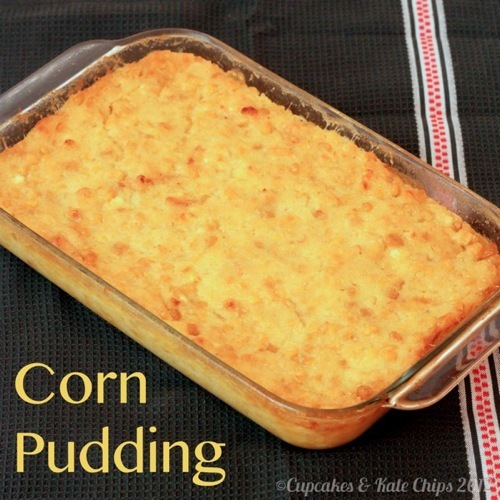 I hope that you made and enjoyed the corn pudding! I would like to make this in a crockpot due to lack of oven space for our Christmas. Yes? No? I have not tried it, but I always say I am going to. I thin it would work, but can’t confirm. If you do, let me know! Have you tried almond milk in this recipe? I was curious if it would affect taste or consistency. I have not, actually. I think it would work, but I can’t confirm. My family has been making this recipe for over 20 years! It is seriously my FAVORITE food EVER!!! Good to know others are enjoying it as well! Haha, we typically double the recipe too! Hi there! This sounds yummy, do you mind telling me what the consistency is on this? I noticed there was no flour or cornmeal, so was wondering if it’s runny? And approximately how many servings do you get from this recipe? Thanks! It actually sets up when it baked from the eggs and cornstarch. It’s soft, but not runny. What’s the rule on mixing all the ingredients and refrigerating until morning to cook? Yay or nay? Totally fine! We do it all pretty much every year! 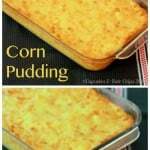 Corn pudding is my family’s tradition at Thanksgiving, Christmas and Easter. Your recipe is very close to mine; we don’t put sugar, cornstarch or mustard in mine, but pepper, a little flour, baking soda and crushed crackers on top (with the melted butter over it). A lot of people I meet have never heard of corn pudding. Oh I love corn pudding! Thank you for sharing on Thursday’s Treasures sweetie! I’m featuring this on Week 67. Please get your featured on button when you stop by. <3 and hugs! Thanks so much! I am truly flattered. Just getting to respond now, but I did notice this earlier, and made sure to share your party on my Facebook page! Ooooooooooh this looks G DOUBLE O D GOOOOOOD! Gawd, I want that for BREAKFAST!